I ought to say - because I look at them everyday - that i abslotlutely love the pictures that you select for your blog. They are each thought provoking and rather beautiful. I almost think I've seen this one before. 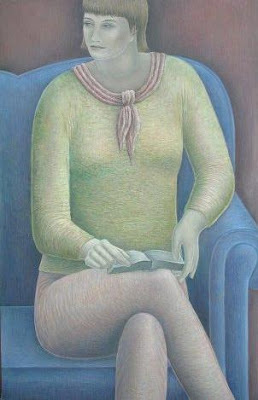 What a lot of paintings Addall has done that are on this theme of reading, and what a distinctive style. Sorry about misspelling Addinall! And yesterday's painting is the one I want to walk right into! But I will soon. Saturday I leave for two weeks in Venice, Florida. I'm glad you like the pictures, it is so much fun looking for them. Yes, she has quite a few Reading pictures - but this was the last one. Maybe I'll show some of her other paintings another time. Have a nice trip to Florida - sounds perfect this time of the year!